Comes standard with 2 antique brass Cup Pulls, and 2 antique brass Mirror Swivels. Features a tilting mirror and 2 drawers with wooden drawer glides. Comes with 2 L-brackets for attachment to your vanity. Top of mirror frame is 20-1/2 H from top surface. 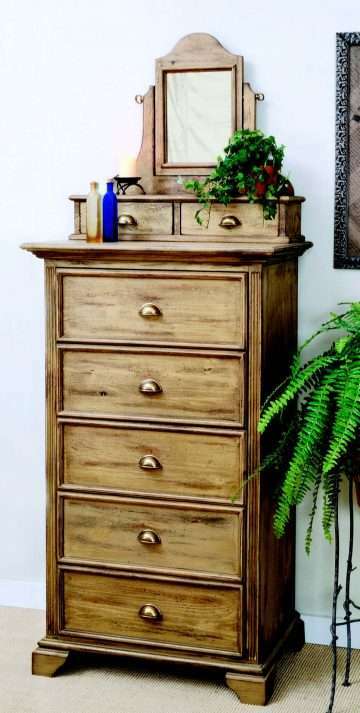 Shown with HDR5-Heritage 5 Drawer Dresser. Ships in 2 corrugated cartons (Mirror/arms-10 lbs and shelf-18 lbs) on 1 wooden pallet (50 lbs) by common carrier.